Hardly anyone stays in Pakbeng for more than one night – but Pakbeng Lodge gives you good reason to. Average rating 8.7 from 115 reviews. Located on the banks of the Mekong less than 500 metres west from the pier, the hotel block is new yet tasteful and it maintains a traditional feel – something the town seems devoid of. Every room has large windows, wood floors and a balcony overlooking the river. The gardens and grounds are exceptionally pretty. It’s the kind of place where you could throw open your doors and spend a whole day decompressing, watching the world drift by from your balcony or from the lodge’s long, elegant and breezy restaurant/bar. The lodge is clearly built for and caters to large groups that sweep in for the night. But for the independent traveller they can offer massage, treks and packages that include elephant experiences with Mekong Elephant Camp, an affiliate that is just across the river. Book these offerings in advance. To get there, from the boat pier head up the left road. It’s a solid 10-15 minute walk on dirt road and so you should contact them beforehand about pick up. Room rate is half-board, with breakfast and a set menu dinner included. 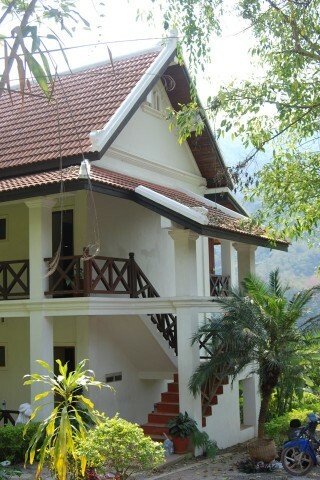 Check rates at Pakbeng Lodge on Booking.com.